Halloween is a creative holiday that includes aspects of the fall harvest along with scary costumes and candy. 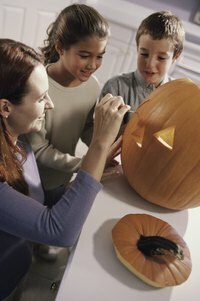 When creating Halloween crafts in Sunday school, you can encourage kids to focus on the positive aspects of autumn, such as celebrating God's gifts, sharing treats and having family fun -- sidestepping the scary and enjoying fall and its blessings. One way to share the light is to create a decoupaged glass candle holder that includes things like a poem, and photos or drawings of pumpkins, bats, black cats, owls, corn, apples and autumn leaves. A strand of raffia or ribbon tied around the top completes the piece. Directions: 1.Using a sponge brush, apply a layer of thinned decoupage medium onto the jar or vase surface. Smooth the poem onto the vase or jar, carefully press out air bubbles. Apply another layer of decoupage medium -- it will dry clear -- and add images of the animals, pumpkins, and other items. Let the decoupage medium dry, and then seal the entire surface with additional medium. Tie on the raffia and place the battery-operated candle inside the holder. Make a wall hanging or greeting card featuring a scrapbook paper pumpkin with a hand print leaf. Directions: 1. Have each child draw a pumpkin-shaped circle on the back of the scrapbook paper with a pencil. Cut out the pumpkin with scissors. Rub the glue stick on the back of the pumpkin. Turn it over and apply it to the background paper. Using the paintbrush, apply paint to the palm and fingers of the child's hand. Have each child place a hand print on the top of the pumpkin where a leaf would be. Use the remaining paint on the brush to make a stroke representing the stem. Allow the paint to dry. Punch holes around the edges of the background. Have each child "sew" a border using a piece of yarn with a taped end. Tie the yarn in a bow. Optional: Have each child make a Jack-o'-lantern face with markers and buttons and sign their work. Or write their names for them if they are too young. Preschoolers can be messy, so dry crafts are a good idea for a church setting. If you can, take the children for a walk to gather colorful autumn leaves, or bring some to the class. Using a paper hole punch, punch a hole in each leaf near the stem. Have the children string their leaves onto pieces of twine with taped ends to make garlands. Have each child fill a small cellophane bag with orange jellybeans, cheese puff balls or baby carrots. Tie the bag closed with green raffia or ribbon. Have them cut triangle eyes and noses and crescent grins out of black construction paper, and then help them attach the features to their bags with double sticky tape. Children usually receive treats for Halloween, so give them an opportunity to serve by making something to share. Each child can decorate a brown lunch bag or handled gift bag with construction paper, markers, old cards, glitter and buttons. Fill the bags with popcorn balls, cookies or other treats for the kids to give to neighbors and relatives.